Master West Side Chicago blues guitarist Jimmy Dawkins is gone. Jimmy died from undisclosed causes on Wednesday, April 10, 2013, age 76. James Henry Dawkins was born Oct. 24, 1936 on a farm outside of Tchula, Miss., but spent much time as a youth with his father, who worked in the shipyards of Pascagoula, Miss. Jimmy moved to Chicago in 1955, where he worked in a box factory and began playing the clubs while working as a session musician for the likes of Sleepy John Estes and others. Jimmy was good friends with Magic Sam and just about every other West Side musician one could name in the 1950s and '60s. Otis Rush and Jimmy Johnson each served as his sidemen, with Johnson part of Dawkins' mid-1970s touring band. Rush supported Dawkins on the "Tribute to Orange" album of 1971. Jimmy went on to make records for Delmark, waxing his first full album for the label, "Fast Fingers" in 1969. This disc earned him a Grand Prix du Discque from the Hot Club of France. He also recorded albums for various European labels, as well as for Earwig, Storyville and Fedora, among others. Among Dawkins other top studio discs were "Blisterstring" in 1976, "Hot Wire '81" and "Kant Sheck Dees Bluze" in 1992. The greatness of Dawkins live can be heard on "I Want to Know," "Come Back Baby," and the very rare LP "Jimmy and Hip Live!" Dawkins was one of Chicago's heaviest guitarists. His shows were legendary for starting off relatively loosely in the first set, Jimmy noodling and warming up. Later, however, with audience members in a trance, he would crush them during the third and final set of the night. Dawkins was known for his audacious use of volume at his gigs and for his mastery of controlled feedback. He would hit spine-tingling staccato runs up and down the freeboard of his blonde Gibson, to later ride massive waves of feedback. Under this cacophony, Dawkins' muscled band - including drummer Ray Scott and bassists Sylvester Boines or Cornelius Boyson - undulated a funky groove. Guitarists such as Johnson, Rich Kirch or later, Billy Flynn and Keith Scott, were always stage right to provide Dawkins a chunky rhythm. Dawkins was famous for supporting the budding solo careers of musicians including Vance Kelly, Nora Jean Wallace, Queen Sylvia Embry and Taildragger via his Leric Records label. In 2010 Dawkins helped Delmark Records coordinate a compilation of singles he recorded of these artists for Leric. Jimmy Dawkins seemed to this writer, who began chronicling the bluesman's life for Living Blues magazine and other outlets in 1992, to be a conflicted man. Jimmy's life was filled with incidents of racism which seemed to burn in his soul. There was a rumor his grandfather had been lynched in Mississippi by a white mob. Jimmy also told of having to sleep under his touring van while working certain parts of the deep South because he was not provided hotel lodging due to his skin color. Dawkins also told of a time in the 1990s when he had been chased down the highways of Mississippi at night by an unknown vehicle. "Who are they?" Dawkins asked. Despite his encounters with racism, Dawkins did well fighting what could well have been an urge to be a racist himself. He was always very helpful to white musicians and featured caucasian guitarists in his band from about 1976 onward. He also opened doors for younger musicians and blues journalists whenever he could. Dawkins, himself, was a journalistic contributor to Living Blues magazine in the 1970s. Dawkins lost his son to street violence about two decades ago and according to his bandmates was horribly affected by this. He went on to be a wonderfully doting grandfather to his grandson Darin. Darin was almost always seen at Dawkins rare Chicago gigs in the 2000's and even traveled to Europe with his grandfather so he could remain under his grandfather's watchful eye. Dawkins was with his beloved grandson right up to the end. Jimmy would often take the boy to school in his car, despite the fact he was weak and very ill near the end of his life. 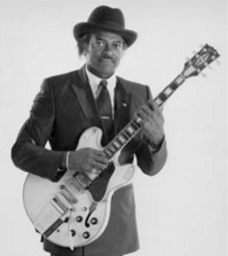 The legendary Jimmy Dawkins will be remembered for his imposing, full-back-like appearance, blistering and immediately recognizable guitar style, gospel-inflected vocals, intellect, business sense and for his caring for others who were trying to make their way in the blues business. Jimmy will be sorely missed by many people who respected and loved him and his music. Thank you for this portrait of a man that was very private yet very public. His outside demeanor could appear unapproachable, but it hid his shyness and cautiousness. He will be deeply missed for his friendship, funny phrases, and his knowledge of the Chicago blues scene back in the day. His music will live on and never duplicated. While I met Jimmy a few times and briefly corresponded with him by mail years ago, I wish I had been able to really get to know him. As it was, I bought all his recordings that I could find (and am still on the lookout for more). His sound was so powerful and full of soul. He was a serious bluesman and did not play games. Thankfully, he made many recordings, both as a leader and as a sideman, that we can continue to hear on into the future, but I was hoping for at least one more! Jimmy Dawkins will not be forgotten.